YANGON: Myanmar netizens were in an uproar on Monday (May 29) after Facebook seemingly banned people from posting the word "kalar" - often used as a slur against Muslims - at a time of rising Islamophobia in the country. Facebook is under global pressure to clamp down on hate speech, violent threats or deliberately misleading information on their platform - with efforts showing varying degrees of success. A spokeswoman for Facebook said the company was working to combat hate speech but as "our teams process millions of pieces of reported content each week... we sometimes make mistakes". A spokesman for the Myanmar government said it had not pushed for a ban. Two angry Facebook users have responded to the apparent ban by creating an event called "We own Kalar" in protest. By early afternoon about 1,400 people had said they were interested in attending the gathering, scheduled for Wednesday in Yangon. "Even though no action is taken against fake accounts which share hate speech and spew abuse... action is taken over (words we use every day)," said the organisers. "We own the word as we have been using it for decades and over the centuries." 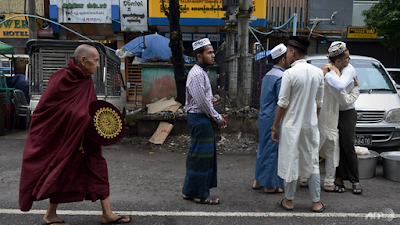 They have shut down religious events, forced two Yangon schools accused of illegally doubling up as mosques to close and this month clashed with Muslims after pushing police to raid a house in their neighbourhood.